Two people were killed in a serious accident on the M56 eastbound near the Runcorn exit, junction 12, midday yesterday (Thursday 9th Oct 14). Two other people were taken to Warrington General Hospital to be treated for minor injuries. Cheshire Constabulary confirmed one of the victims was a woman aged 38 from St Helens who was driving a red Audi. They are in the process of formally identifying the second victim, a man who was driving one of the two HGVs that were involved in the crash. 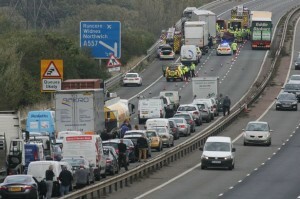 A coach with no passengers and a black BMW were also involved in the accident. The entire M56 was closed for a time and traffic diverted off the motorway at junction 14 and back onto the motorway at junction 12 via the southbound A5117 and northbound A56. The incident caused heavy congestion in Frodsham and affected traffic across the northwest before the road fully reopened at 11.30pm on Thursday night. This article was added on Friday, October 10th, 2014 at 2:31 pm and is categorised under Cheshire News, General News, Runcorn News, Traffic Accidents. Both comments and pings are currently closed. Error: Error validating access token: Session has expired on Saturday, 09-Mar-19 13:12:58 PST. The current time is Thursday, 25-Apr-19 10:10:06 PDT.